1. If the allele for dark-colored hair is dominant over the allele for light-colored hair, which is LEAST likely? A. A light-haired couple produces a baby with dark hair. B. A dark-haired couple produces a baby with light hair. C. A light-haired woman and a dark-haired man produce a light-haired baby. D. A dark-haired woman and a light-haired man produce a light-haired baby. E. A dark-haired woman and a light-haired man produce a dark-haired baby. 2. Which of the following are in order of least complex to most complex, in terms of the amount of genetic information they carry? 3. An organism that demonstrates radial symmetry and an exoskeleton would be classified into which phylum? 6. What prevents ions from crossing the plasma membrane via simple diffusion? A. Ions are too large. B. Ions carry a charge. D. Ions do not produce a concentration difference. E. Ions cannot interact with membrane-bound proteins. 10. A test cross with an organism with a homozygous recessive genotype results in 50% of the offspring exhibiting the recessive trait. What is the genotype of the test-cross parent? 11. Which biological molecule is associated with iron (Fe) ions? 12. The graph depicts the population size of a species over time. What growth pattern is the population demonstrating at time 1? 13. The graph depicts the population size of a species over time. 14. The graph depicts the population size of a species over time. Which of the following could account for the differences in population size between time 2 and time 3? 15. Medical researchers tested two different medications for treating type I diabetes. Both Drug 1 and Drug 2 mimic the effects of insulin on muscle, brain, and liver cells. The graph depicts the serum (blood) levels of the drugs in patients through eight hours after injection. Which of the following can be inferred from these data? A. The effects of Drug 2 are longer lasting. B. Drug 1 is faster acting than Drug 2. C. Drug 1 is at its highest concentration upon injection. D. Drug 1 and Drug 2 have about equal concentrations after four hours. E. Drug 2 is most highly concentrated within two hours of injection. 16. Medical researchers tested two different medications for treating type I diabetes. Both Drug 1 and Drug 2 mimic the effects of insulin on muscle, brain, and liver cells. 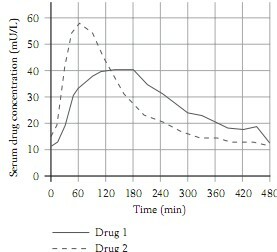 The graph depicts the serum (blood) levels of the drugs in patients through eight hours after injection. A patient with type I diabetes eats a large meal and then takes a dose of Drug 2. If the drug is effective, what changes will occur in the patient? I. The amount of glucose in the blood will increase. II. The amount of glucose in muscle cells will increase. III. The amount of glucose stored in the liver will decrease. 17. Medical researchers tested two different medications for treating type I diabetes. Both Drug 1 and Drug 2 mimic the effects of insulin on muscle, brain, and liver cells. The graph depicts the serum (blood) levels of the drugs in patients through eight hours after injection. How will the two drugs most likely differ in their effects on a diabetic patient's blood glucose level? A. Drug 2 is more likely to cause blood glucose to drop too low. B. Drug 2 is more likely to cause blood glucose to rise too high. C. Drug 1 is more likely to cause blood glucose to remain high after a meal. D. Drug 1 is more likely to cause the liver to break down glycogen. E. Drug 2 is more likely to cause the liver to break down glycogen. According to the pedigree, what is the most likely genotype of individual III-5? Which individual is most likely to be a carrier of the trait in question? Considering the phenotypes of generations II and II, what is the most likely genotype of the man in generation I?